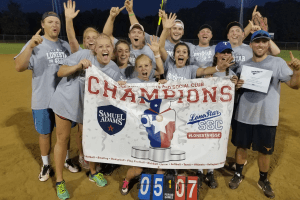 It was the last week of the season at our Monday night softball league out at McInnish Park! It was a dry, hot night, but that didn’t seem to stop the teams. Everyone was fired up to play and make it to the championship game. After battling in their first games, Master Batters and Slapnut Magoos took their spot in the championship game. Master Batters had only lost one game during the regular season, coming in second place in the league. They had their revenge in the playoffs against the one team that beat them, and ended up taking the W to lead them into the playoffs. There, they faced off against the first place seed and the champions from last season! Both teams played some solid softball with hard hits and good defensive plays, but Master Batters finished on top winning it all 7-5. Congrats to our new league champions, Master Batters!